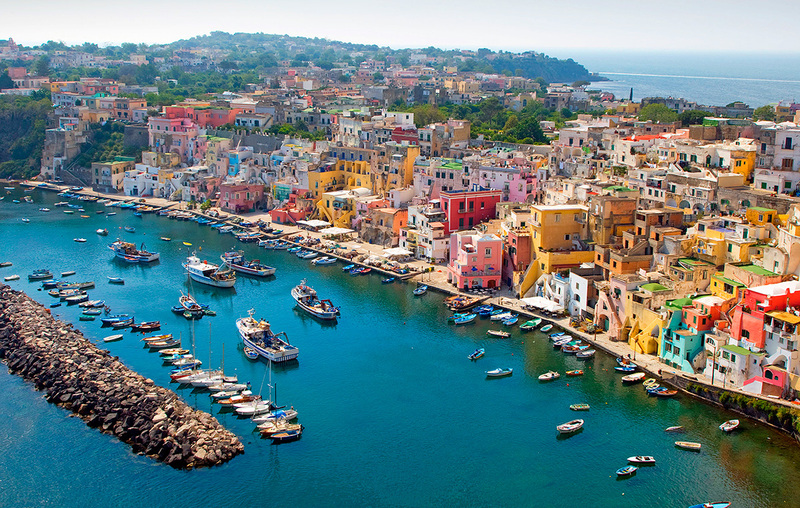 In the north-west corner of the gulf, Procida Island is quite low except for its east tip, where an impressive castle looks across the strait towards Capo Miseno. The main harbour and marina are on the north coast, where the town has a Moorish flavour, its houses huddled around a gleaming white church and a prominent dome. The place seems very old as you wander the narrow streets, yet is probably the least touristy port of call hereabouts. It also feels independent and self-sufficient, almost like a pirates’ lair. Treasure is probably buried here. In quiet weather make for Cala di Corricella, on the south side of the fortress headland. Here you can anchor close under the fort, or further into the bay off the village, whose inner harbour has a simple rubble breakwater. Corricella is an astonishing cubist extravaganza, its houses daubed all colours of the rainbow – some boldly bright, others weathered to faded pastels. It feels out of this world as you climb through the intricate layers past precarious balconies, rickety washing lines and tiny terrace gardens. There are restaurants galore, including the sublimely fishy La Lampara overlooking the harbour. Close west of Procida, much larger Ischia feels completely different, its high majestic coast softened by lush vegetation, which thrives on the fertile volcanic slopes. 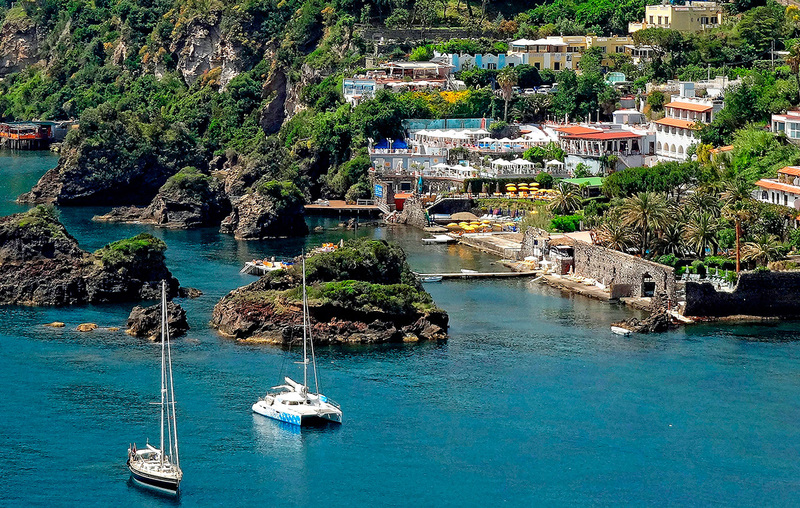 Fragrant shrubs and vivid wild flowers help make Ischia an exotic escapist’s dream far from the cold grey north. The composer Sir William Walton was one notable escapist and his charismatic wife Susana established five acres of paradise gardens at their villa La Mortella, on Ischia’s north-west corner. The upper level has an open Greek theatre, where summer concerts enhance the magic of this special place. Ischia’s main harbour is on the north coast, an almost perfectly enclosed circular inlet with a narrow entrance gap and a constant stream of ferries and hydrofoils. Although hectic this port is a must-see, if only for a passing visit. It has a plush Riviera feel, with yachts and motor boats in crescent rows and a tangled town looking typically Italian. A little further west, Casamicciola Harbour is usually better for a quiet berth. I have a favourite restaurant here called Cantinando, a few blocks back from the sea on Via Monte della Misericordia – unassuming suburbia outside, culinary bliss within.